Henry Cloud is the coauthor of the perennial psychology bestseller Boundaries, which has spawned a series of other books (Boundaries in Dating, Boundaries with Kids, Beyond Boundaries… I’m sure it’s only a matter of time before we get Boundaries for Grandparents, Boundaries with Siblings, The Return of Boundaries, Boundaries Strike Back, Boundaries: First Blood, Part 2, etc.). 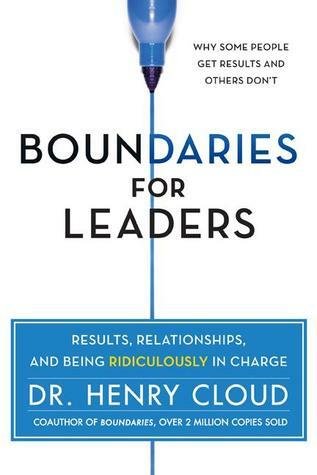 The latest in this series is Boundaries for Leaders. In his solo books, Cloud tends to focus on the psychology of business and leadership, drawing on his experiences as a consultant. This book is Cloud’s plea for leaders to foster the kind of culture that enables their people’s brains to work optimally, using the three “executive functions” of the brain: attention to what is relevant, inhibition of what is distracting, and the working memory to always stay aware of relevant information. The boundaries Cloud writes about for the bulk of the book have to do with setting the right emotional tone, staying connected, reducing negativity, focusing on things that can be controlled, creating the right values, and fostering an environment of trust. At the end, he writes about the leader creating boundaries for him- or herself. But this book isn’t just a restatement of the obvious. Cloud’s major contributions are that he roots his insights in neuroscience, and he makes creating the right kind of culture the responsibility of the leader. That’s the “ridiculously in charge” of the subtitle. Leaders, Cloud says many places throughout the book, get what they create and what they allow. It’s a heavy responsibility, but one that leaders everywhere need to be reminded of. Note: Thanks to HarperBusiness for a review copy of this book. I was not asked to give a positive review.